My first couple of days were quite overwhelming, especially while still suffering from jet lag, and it really seemed like there was no part of living that I can assume works the same at home, but it wasn’t long before I adapted to them as normal life and realised that coming back to England would be another shock! I lived in a bamboo house which was just perfect – simple but perfect. It was a rural, and occasionally noisy setting but offered me privacy as long as I kept the hens out (although they started laying the occasional egg on the verandah as a gift). The noise came from pigs, dogs, cockerels, thunder and rain on the corrugated steel roof! The people were lovely and endlessly patient both in the office and when I was out and about. I was the only European that I saw and this largely seemed to be a benefit with the curiosity leading to positive contacts. Having been introduced to local life they then let me find my feet in my own time. I generally let them know my plans so they wouldn’t worry and they always made sure I had phone numbers in case of emergency. It took some time for me to convince them I really did want Philippino food and not what I was used to. There was a food stall just on the road by the office so I regularly got my lunches from there. It was hot and humid but the air con in the office (when there wasn’t a brown out) kept the temperature ‘down’ to 26C – lovely not to feel the cold for a whole month! I was a total convert to using my umbrella almost all the time either against the rain or the sun. Transport was fun – the ‘tricycle’ (motorbike with side car) provides transport to work (and blow dry for hair! 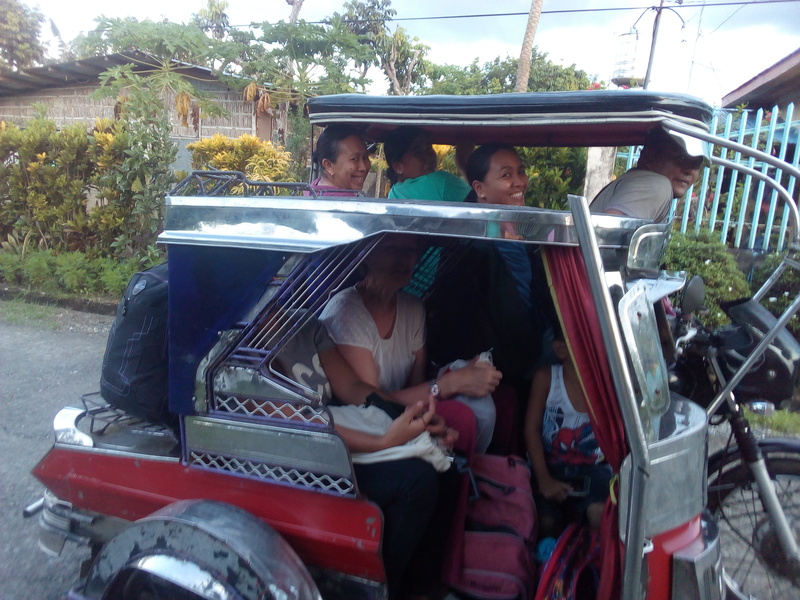 ), the jeepneys (fabulous low level lorries/buses often elaborately decorated with plastic fold down windows) provide longer distance travel and then there are ‘Vans’ too for long distance which they prefer but I found much more crowded – 18 people (plus 2 toddlers) in space designed for no more than 12! The jeepneys once full inside they just start hanging on the outside but don’t expect me to do that? The tricycles vary in size but generally fit 3 in the side car and 3 behind the driver on the motorbike – the record though was 14!! However fitting me in/onto them can cause quite a lot of amusement but I got the hang of it! There continued to be endless small fascinations with the way of life even as I felt more settled and had largely adapted. My placement involved 2 trips – 1 to a project and the other as a thank you. Our field visit was up into the hills to see a community of the indigenous people that PMUI are focussed on helping. This was the first time I have seen real poverty since I have been here – life for most people seems to be simple/basic but ok. These guys can't always afford food and their houses were falling apart and definitely not weather proof. Add to this the challenges because they have minimal rights due to no birth certificates/land title and it is easy to see why PMUI are needed to help get them linked into the system. Also good to see their enthusiasm for change although interesting to be told that initially the adults were reluctant for the children to have education in case they turned the knowledge against them – the adults also now get literacy and numeracy education. 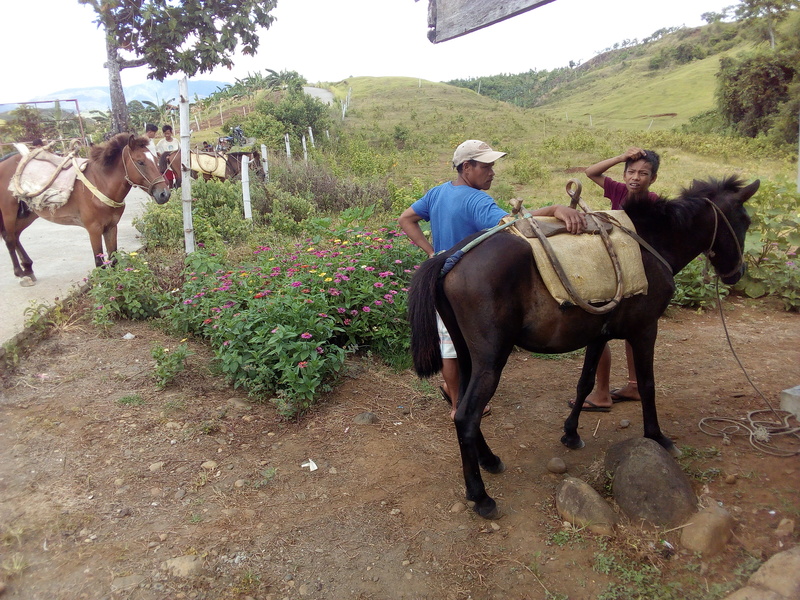 It was during this trip that one of the funniest things happened – my horse suddenly decided he had had enough – dug his heels in and then, as the boy leading him encouraged him to get a move on, he just sat down!! Very carefully (not collapsing or stumbling) so he took care of both himself and me. I then got off! Everyone took a rest at that point (apparently they had been thinking of doing so anyway) and then it was agreed that I could walk the rest of the way (phew! – for me and the horse – a wooden saddle really isn’t comfortable) as there were only 6 or 7 more rivers to cross. The ‘thank you’ trip was definitely one of the highlights. The day started at 6am and involved a trip to another part of the island where we got a boat to go snorkelling on a coral reef. The sea was truly the colour you see in the holiday brochures and so clear that I kept asking how deep it was because you could hardly tell the difference between 2m, 10m or something more. And of course, it was warm! And the fishes, clams, sea urchins, corals…really were the stuff of dreams. Once work started in earnest there was so much to do and time flew. The starting point was to get the structure in place and start improving their Excel and general PC skills. Once they realised they didn’t know what they didn’t know, and that I might know, the questions started coming thick and fast. After a while I was nicknamed their Fairy Godmother – or Fairy for short! My evenings also passed quickly – writing a diary, keeping in touch with UK work, family and friends and getting to know a bit of the language – slowly but surely I got to the point of being able to recognise the occasional word (as well as the sprinkling of English). Tagalog has many words based on Spanish as a result of their history which was helpful and lunch time regularly included trying to teach me a helpful phrase.